Breaking concretes アーカイブ - Hirado Kinzoku Kogyo Co.,Ltd. 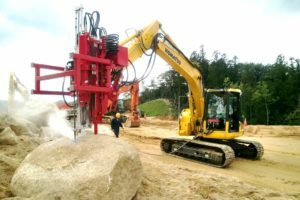 These Rock Splitter can work in many job site such as mining, quarry, demolition of bridge, development of residential land, sewerage job site, underwater etc to break rocks and concrete. Hydraulic pressure move the cylinder and thrust the wedge. Therefore less noise and less vibration compared to hitting. Moreover it is safe because gunpowder is not required. 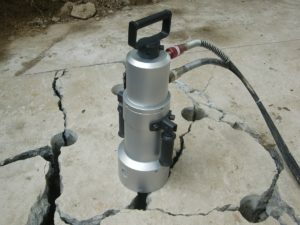 There are many choices such as small, large, with bracket, with driller etc. 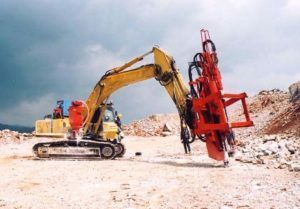 These machines are used for in many kinds of job site such as demolition work, partial demolition work, refurbishment work, retrofitting work, power pole demolition work, concrete foundation demolition work etc.These machines can work by HIRADO hydraulic pump (200~400V 3-phase). 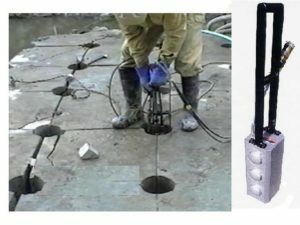 It is designed to avoid noise, vibration and dust. Therefor these machines are suit for the work in school, hospital, residents area. This wedge can split Concrete , Granite rock, Garden rock and so on. Made of special alloy steel, outstandingly durable comparing to conventional Wedge & Feathers. Integrated parts are easy to set, all parts do not go apart. 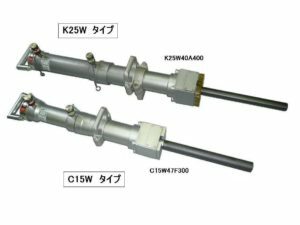 The parts won’t be lost, and work efficiently increase. Friction on the slide surfaces is small, large hammer is not necessary.